Lindsay Mason: A swell time! Morning readers! And a special welcome to new followers. It was so dank and cold when I got up at quarter to six this morning that I put the heat on to take the chill off. Now it's blazing sunshine so the doors are all wide open and Thomas and Tara are doing their rounds of inspecting the garden. No time for me to get on top of the weeds that are fast turning into triffids again though, as I need to crack on with getting samples made as well as working on new stamp designs. I had a lovely day at Inspirations in Preston meeting lots of very keen crafters. As well as sharing our enthusiasm for all things creative we managed to fit in some chat about our cats, gardens, families and quite a few other things! It was great to see new faces as well as familiar friends...thank you again Jacqui and Christine for the cosy socks which are hilarious and will make me smile every time I wear them! Thanks too to Pam for the banana which kept me going when I didn't take a lunch break - your cat, Tiny, is gorgeous and I love the name!!! It was very nice to be only a fifteen minute train journey from home at the end of the day and I was back in the house by 5.30pm along with a tasty dinner from the new Chinese takeaway that's just been opened nearby - it was delicious and I didn't feel too guilty as I'd hardly eaten anything over the previous few days. Thankfully, although one side of my face had swelled out so much that my mouth was distorted (!) the throbbing pains had lessened and Karen and her team kept me topped up with hot drinks which really helped too. I really appreciate the kind comments and suggestions that have been sent to me regarding the post root canal problems I've had. I still have a swollen, numb jaw and yesterday I woke up to find I couldn't speak! Unfortunately, this meant I couldn't announce the hymns in Church in the morning and I also had to pull out of doing the readings at a service that evening too. My voice has come back, though it's pretty croaky and intermittent...roll on Tuesday so I can get in touch with my dentist and, hopefully, get this darned problem finally sorted! 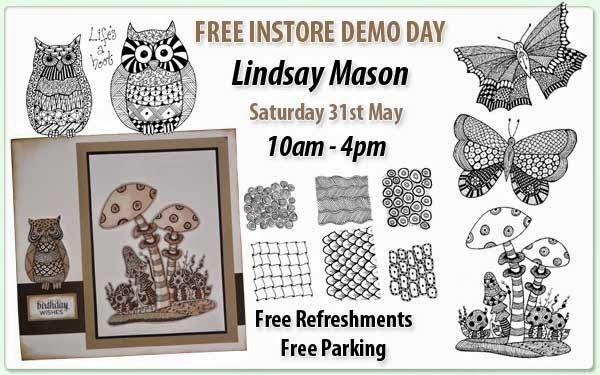 On Friday I'll be travelling down to Peterborough for my demo day at Sir Stampalot on Saturday. Looking forward to this as it's been a while since I was at Janice and Andy's lovely store. Hope to see lots of you there! I'll be working with my latest stamp sets including the Zendoodle range as well as using Dylusions ink sprays to create some great backgrounds and starting points for doodling. It will be a colourful (and doubtless quite messy....!) day. Well, the morning coffee has been drunk, the antibiotic pill has been taken and it's time to get on with work, so I had better sign off for now. Enjoy the holiday monday everyone. I hope your voice is back! And no more side effects.